I love my husband, my daughter, my students, my dog, my garden and my home, but not always in that order. As dear as these are to me, my idea of a vacation is time away from “wife-ing,” mothering, cooking, cleaning, weeding, teaching and picking up after my dog in the yard (no small chore—I have an English Mastiff). Give me a weekend away and I’ll be a better wife, mom and teacher. Give me eleven days away and I’ll deliver world peace, convert whole tribes in New Guinea to Christianity, finally play the second page of Kreisler’s Praeludium and Allegro without missing a note, and run up Mount Whitney barefooted and backwards while knitting sweaters for children in Afghanistan. Well, OK, maybe I’d just feel I could, but isn’t believing you can do something the first step towards making it happen? (If that isn’t a Suzuki-ism, it ought to be.) If someone had told me, that in addition to getting away from my daily responsibilities, there was a place I could go where I could immerse myself in good music, finally be alone with my thoughts, make new friends, improve myself professionally, and have plain, old-fashioned, goofy fun, I would have thought it was too good to be true. Wouldn’t you? Think again! No travel agency in the world can offer you what a summer Suzuki teacher training course can. Whenever possible, I prefer to drive instead of fly. This has less to do with 9/11 than it does with my philosophy to “live slow.” We tell our Suzuki parents to be patient, to trust the little baby steps we have to lead their children through; to me that is high irony. We’re so accustomed to instant gratification in this country that we complain about a five-minute wait at a fast food drive-through. Plain old Internet access isn’t enough any more—now we have to have DSL because it’s faster. Cars now come equipped with TVs (some with remote controls!) to occupy the minds of our children in order to make travel less stressful for the adults. Heaven forbid that parents and children actually interact on a trip (shudder!). Parents sign kids up for preschool programs that will look good on college applications fifteen years later. I teach violin students who have two and three activities every night of the week; a colleague has told me one of her students falls asleep in the car on the way to her lesson, and then has the lesson wearing a tutu. Somehow in our eagerness to arrive, we’ve forgotten the value of the journey. We’re so familiar with sound bites and constant noise that we’re losing the ability to listen—to each other, to ourselves. For me driving provides an oasis amidst the arid chaos. I can process my thoughts, sing with the radio, and see parts of our beautiful country I’d never see from 35,000 feet. Nestled in the middle of nowhere (literally) in the foothills of the Appalachian Mountains, I would later discover E&H to be an elegant old campus with brick-lined shaded walkways, a duck pond and its own rolling golf course set off by split rail fencing. Walking to or from classes during my training there, I was to see inspired children practicing their violins beneath the ancient, gnarled trees. I would wonder how many generations of college students those branches had sheltered, and was this the first time they had heard violins played by children? Internet photos had shown me E&H’s renovated buildings with tall, modern Palladian windows and blond honey interior woodwork belying the school’s age. It may have been founded in the era of the Pony Express, but now it had indoor plumbing and electricity; I knew it would be a comfortable and happy place to vacation—er, learn about music. The best part of the long drive from Arkansas to Virginia was getting to listen to my favorite CDs without my teenage daughter rolling her eyes and begging me not to push repeat one more time. I drove a little too spastically out of Little Rock listening to Michael McLean’s CD Care To Tango—(foot-tapping on the gas pedal has legal consequences). I drove through Memphis listening to 10,000 Elvis Fans Can’t Be Wrong (thank you, thank you very much), and hit the North Carolina/Tennessee border with Lara St. John playing Partita No. 2 in D minor. To milk my time in the car for all I could, I detoured through the Smoky Mountains. Emerging through an other-worldly pellucid mist, I crested Mount Mitchell on sunrise of my second day, singing Somewhere Over The Rainbow with Eva Cassidy at the top of my lungs. It was a spiritual journey: I’d just traveled from South America to the Land of Oz with Elvis and Bach. Who could’ve known that I would find nirvana in a Chrysler Town & Country mini-van on a county road somewhere between Bat Cave and Faust, North Carolina? Excerpt only. Read the complete article in the American Suzuki Journal. Previously printed in American Suzuki Journal 31.2. Reprinted with permission. 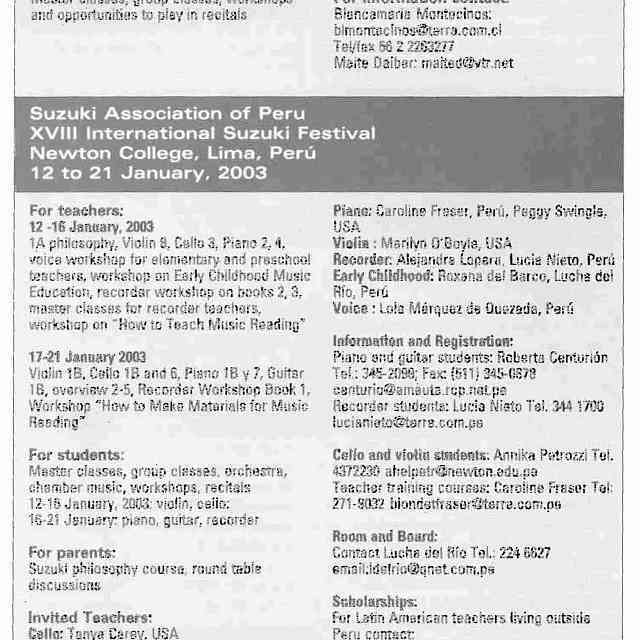 Copyright © 2003 Suzuki Association of the Americas, Inc.